It's been a big week. I didn't mean to, but I pretty much took the week off. I have been gallivanting around town eating ridiculous good Japanese food, enjoying birthday celebrations with family and friends (I just turned 27 on Monday), reading magazines and working towards deadlines. In those few moments of relaxation amongst the celebrating and chaos, I also joined Instagram. I'll be trying to capture the peace and prettiness throughout my day. 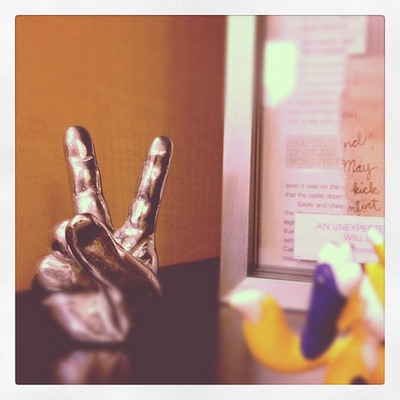 This shot: peace paper weight from my mother-in-law, Pokemon figurine a coworker thrifted for me after Michael and I were a few for Halloween some years back, text collage I made for my a third year architecture studio when I was in school.